Last week on Facebook, Simon Says Stamp was looking for volunteers to agree to post a few cards with some of its September release. I won! I received a new set in the mail the other day and SSS asked that I post something with it on Facebook. The set is a Christmas sentiment set, but -- since it is August -- my mind went elsewhere first. I am always on the lookout to use those little images that companies add to sets. In this case, I love the little happy banner and Love circle. So, I added them to a sentiment from the set that is part of the September card kit, To Thine Own Shelf (great book lover's set). 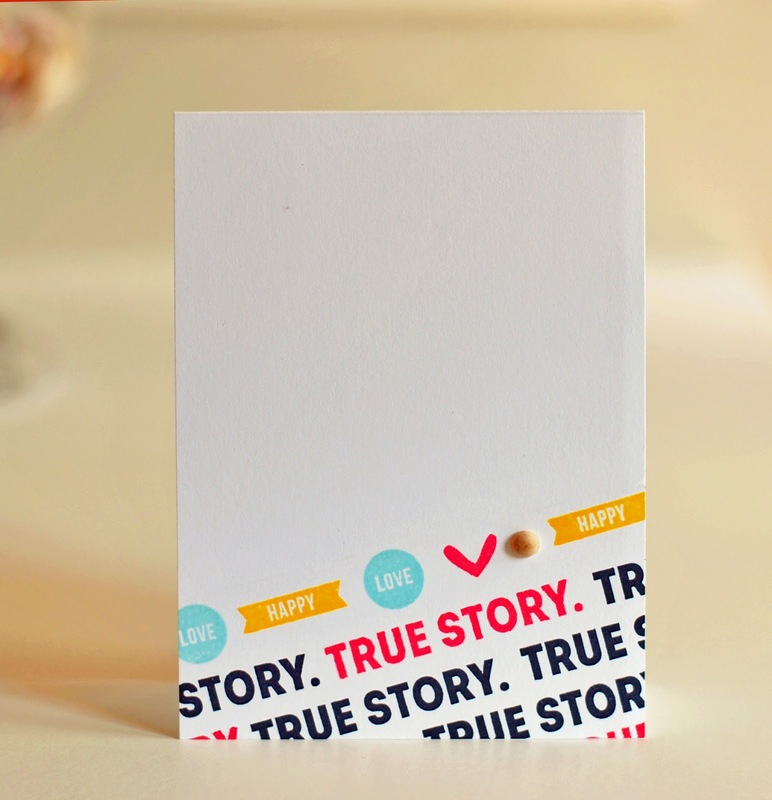 Added a heart from another Simon Says Stamp set and a wooden button that was also part of the September card kit. Cannot see in the photo, but above the top row, I scored a line. To add images or sentiments in an angled line, using a ruler to draw with a pencil and using a gridded block are essential! Hope to have a few more cards later this week. MOOD WHEN DONE = Very happy, and that is a true story. Oh this is very cute! nice color choice as well. Awesome! Love the colors and diagonal exactness. So graphic and fun ... ♥ it. What a great win....SSS, known to nearly everyone in the stamping world! You've done them proud with this card. Fresh and absolutely lovely, Joan! So clean and perfect. They were smart to choose you. Congratulations on winning this kit. You did a fabulous job on your first card. SUPER adorable Joan....love the elements you chose to make your card!! Very well put together!